This is caused by your “Egosystem” — a constant, unconscious preoccupation with your self-worth. It has led each of us to accumulate limiting mental models, engrained dysfunctions and knee-jerk reactions (see Common Issues). 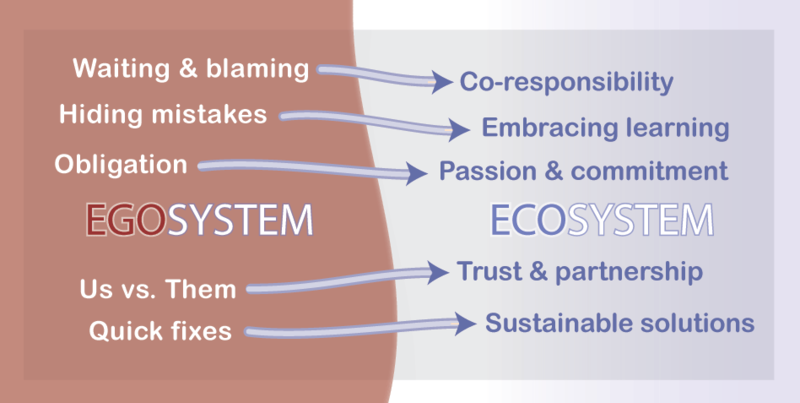 Learn to become an Ecosystem Leader. Most leaders today feel driven — to measure up, to meet their numbers, to get ahead. This “performance anxiety” paradigm produces passable outcomes, but often at great cost to professional and personal relationships and an organization’s cultural health. Leaders who learn to shift Egosystem-driven behaviors, individually and organizationally, empower their organizations to operate in an Ecosystem. Create an environment where employees feel inspired to invest their whole self at work, taking risks and owning responsibility. 35 years of research and practical application in the field have evolved this methodology (see core concepts) into an unique and carefully architected set of programs whose results speak for themselves. Our training is designed to be gently disruptive and deliver unexpected, powerful, long-lasting transformation. It is for people who take their development seriously. I owe an incredible debt to the path-breaking work of LaL. I have been studying and thinking about the strategies of tempered radicalism for almost fifteen years. Nevertheless, LaL has influenced my thinking and my life enormously. I’m fascinated at the overlap between the teachings of LaL and the psychological research literature on people’s essential needs, the self-esteem system and the circumstances that encourage true mastery and relatedness, rather than the illusion of competence and feelings of superiority. It has challenged me to push the envelope of my own research in the field.